Timor Post, May 27, 2010 language source: Tetun - Ex-FALINTIL commando, MP Cornelio L-7 da Conceicao Gama, has said that the ex-guerilla fighters are ready to fight against the illegal armed group in Ermera that wanted to destroy this country. “We, the ex-guerilla fighter,s are ready to fight againstany illegal armed group. We will hunt them down, because we do not want people of this country to suffer again and this is our statement as ex-guerilla fighters,” Gama said. 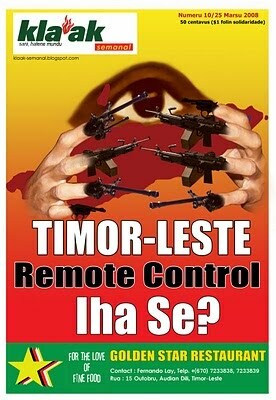 He said that there is no reason for anyone to carry weapons illegally as Timor-Leste had reached its independence. “We engaged in war, some died, were wounded and lost families. We suffered but we did that for the sake of us. We have reached independence but if they [illegal group] want to create conflict then they have to be careful. We will arrest all their family members because we do not want to suffer again as our past was a bitter experience,” MP Gama said. Meanwhile, the Parliamentary Committee B for Defence and Security President Duarte Nunes confirmed that many of the weapons belonging to the National Police went missing during the 2006 crisis and had not been recovered yet. However MP David Dias Ximenes, also a member of the Parliamentary Committee B, said the Committee B had no document about the missing PNTL weapons. According to the Timorese National Police, Superintendent Chief Mateus Fernandes, the current situation in Ermera is under control. He made the comments regarding the widespread rumors that there was an illegal armed group in Ermera led by an ex- 745 battalion of Indonesia’s TNI.